i needed an easy-as-pie craft for this week as i’m working on a couple bigger crafty projects right now. these replacement cotton squares cost me about 60 cents and took me about 15 minutes to make. talk about quick and easy! these handy little things are one simple way to “go green” in your house. 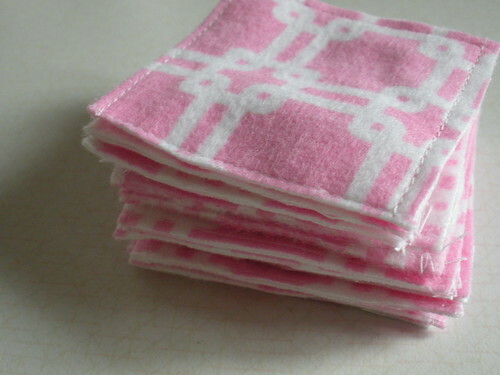 instead of using a cotton ball or cotton square [as i call them] to take off your make-up or clean your face or whatever you can use a cotton ball for, you can use this reusable fabric replacement! i was inspired by this link, and she says that she washes them in a lingerie bag so they don’t get lost. now i need to make one of those! 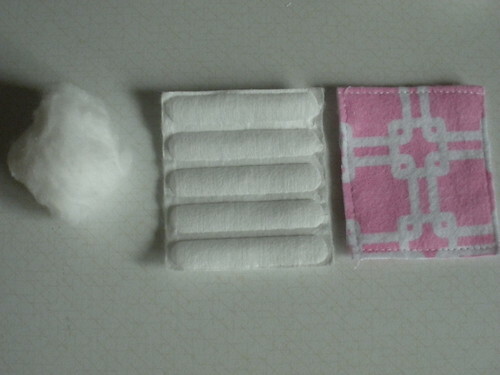 what is a cotton replacement square? and what does it do? I didn't mean to sound snotty or disrespectful in my last comment…just wondering! :) Maybe I need some cotton replacement squares and I don't know it?! the can replace cotton balls, used for removing make-up or cleaning your face.